Happy Friday! It’s been a busy week on here and I haven’t even gotten around to sharing and style inspo with you until now! I’ve loved hearing all of your feedback on both The Faster Way post as well as the Interior Renovation that I shared. I love that I can share a little bit of all aspects of my life on here, because it all ties together for me and is hopefully helpful in one way or another for you! This is a typical spring outfit for me, but I love it especially because of this particular color combination. Pink and green is just so good. This sweater is beautiful, light-weight and has a flattering fit with a darling scoop back. It’s 40% off today, so don’t let this one sell out on you! 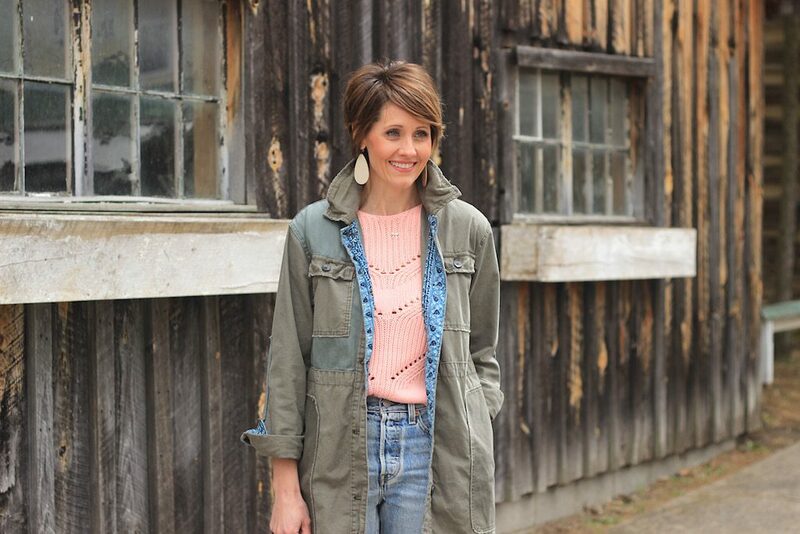 The jacket has quickly become my go-to spring jacket, and one that I wouldn’t have necessarily thought would be. I grabbed it on sale a few weeks ago and love it not only for it’s loose, laid-back vibe, but also for all of the details and longer length. It definitely stands out from my other cargo jackets. It’s a pricier piece for me (which is why I bought it on sale), but I’ll be keeping an eye on it for you guys in hopes that it drops in price again! I’ve also been getting a ton of feedback as I’ve been breaking these Levi’s out again with the weather warming up. I’ve had these since last year at the recommendation of a friend and I adore them. They are the Levi wedgie fit. I believe these are the exact wash, but this pair is also very similar. I size up one in Levi’s, so keep that in mind if ordering.